Catherine Kasper Home (CKH) is a non-profit care facility with a holistic approach. Our spacious, pristine, 81-bed facility is part of Catherine Kasper Life Center, a faith-based community providing a wide range of care services from independent living at the Maria Center apartments to skilled nursing care at Catherine Kasper Home. We pride ourselves on maintaining a high quality of life for our residents. 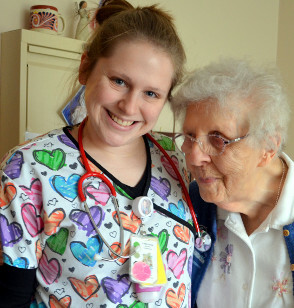 To that end, we have dedicated co-workers ministering to several different types of private living quarters: Medicare/Skilled Nursing Facility, Memory Unit, Nursing Facility, and Non-Skilled Nursing Facility rooms. Every room at Catherine Kasper Home includes, at no extra charge: Pastoral Care, Dietary Services, Nursing Care, Therapy, Activity Services, Art Classes, Social Services, Environmental Services, Personal Laundry Services, and Cable TV Service. These are described in more detail on the services page. In addition, we offer many intergenerational programs such as gardening classes, musical programs, and much more. You are cordially invited to visit our community for a tour and more information about the services we provide.